What is the FE-CBT Chemical exam? How is the FE-CBT Chemical exam structured? What reference materials does the FE-CBT Chemical exam allow? When can I take the FE-CBT Chemical exam? What score do I need to pass the FE-CBT Chemical exam? How many people pass the FE-CBT Chemical exam? What units does the FE-CBT Chemical exam use? How many hours should I spend studying for the FE-CBT Chemical exam? How much should I prepare beforehand for the FE-CBT Chemical course? Why should I take the FE-CBT Chemical exam? How much does taking the FE-CBT Chemical exam cost? Where do I take the FE-CBT Chemical exam? What subjects does the FE-CBT Chemical exam focus on? Why is Testmasters the best choice for FE-CBT Chemical exam preparation? Who teaches the FE-CBT Chemical course? How do I register for a FE-CBT Chemical course? How does the Guarantee of Passing work for our FE-CBT Chemical courses? 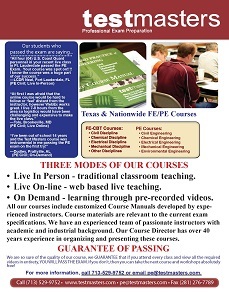 The FE-CBT Chemical exam consists of 110 multiple-choice questions over a 6 hour testing period. This time period includes a tutorial and an optional scheduled break. The FE-CBT Chemical exam is a closed book exam that only allows the use of a provided electronic reference from the NCEES site. According to the January/February and April/May 2015 FE-CBT Chemical exam results, 77% of 853 test takers passed. The aforementioned examinees took the exam for the first time, after having attended EAC/ABET-accredited engineering programs, within 12 months of graduation. FE-CBT Chemical exam results are typically available 7–10 days after you take the exam. You will receive an email notification from NCEES with instructions to view your results in your MyNCEES account. Results include information on how you should pursue your desired career path based on your performance and your licensing board. The FE-CBT Chemical exam utilizes both the International System of Units (SI) and the US Customary System (USCS). The exam consists of a variety of subjects, a majority of which you have learned or been introduced to through your engineering courses. Some of the most heavily tested subjects pertain to fluids and thermodynamics. The exact question breakdown for this exam can be found here. There are a few options available to register for a Testmasters FE-CBT Chemical course. You can register online at our website or you can print out the registration form, fill it out and fax or mail it to our office. Our fax number is (713) 529-4394. You can also call our office at (713) 529-9752 and register over the phone. Feel free to request more information here. Hybrid FE-CBT Chemical Course: If you attend every class and view the required videos and don’t pass, you can repeat the next course absolutely free. To be qualified for the guarantee, you must take the actual FE-CBT Chemical examination within 90 days of the start of the course. Combined Hybrid and Online FE-CBT Disciplines Course: If you attend every class and view the required videos and don’t pass, you can repeat the next course absolutely free. To be qualified for the guarantee, you must take the actual FE-CBT Chemical examination within 150 days of the start of the course. Online FE-CBT Chemical Course: If you view the required videos and don’t pass, you can repeat the course absolutely free. To be qualified for the guarantee, you must take the actual FE-CBT Chemical examination within 120 days of the start of the course.